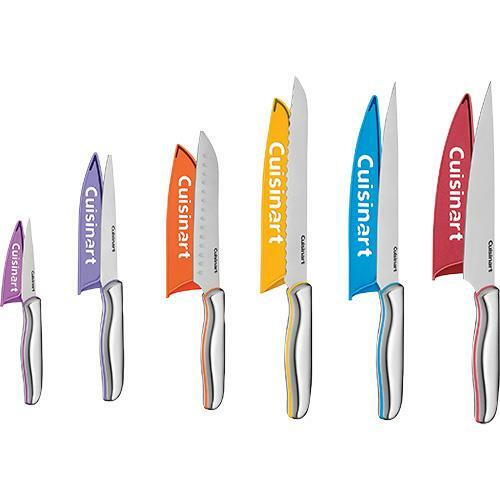 The Cuisinart C77-12PCS is a12-piece Chef Caliber Knife Set which features superior high carbon stainless steel blades for precision and accuracy with matching blade guards. Ergonomically designed stainless steel handles provide comfort. Color coding helps to reduce the risk of cross-contamination during food preparation. 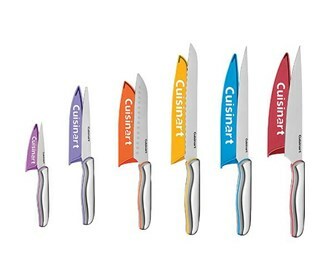 The Cuisinart 12pcs Knife Set has many exciting features for users of all types. See the Cuisinart 12pcs Knife Set gallery images above for more product views. The Cuisinart 12pcs Knife Set is sold as a Brand New Unopened Item.